Political Prairie Fire: The Nonpartisan League, 1915-1922, by Robert L. Morlan. St. Paul, Minn.: Minnesota Historical Society, 1985. "The Nonpartisan League and the Minnesota Campaign of 1918,” by Robert L. Morlan. In Minnesota History, vol. 34, no. 6 (1955): pp. 221-232. National Nonpartisan League Papers, (1915-1927). Contains correspondence and miscellany of Henry G. Teigan, the League's secretary from 1916 to 1923, and other league officials; correspondence, financial records, and other materials of the Northwestern Service Bureau, which assisted local newspapers that supported the league; subscription, financial, and other records of the League's newspaper, the Minnesota Leader; information on an anti-league exposé published by the St. Paul Dispatch in 1918; and other printed materials by or about the League. The bulk of the collection consists of Teigan's files, which provide information about the League's origin, growth, and decline; educational, organizational, and reform programs; relations with members; and publications. There is also data concerning opposition attacks, particularly in Minnesota during World War I; third-party politics, including the creation of the Farmer-Labor Party of Minnesota; and the work of various reform groups in the Progressive era. The Henry G. Teigan Papers Supplement (M183) also contains correspondence regarding the National Nonpartisan League, the ties of its leaders with socialism, and the League's affairs at the state level in Minnesota, and a file on the Northwestern Service Bureau. 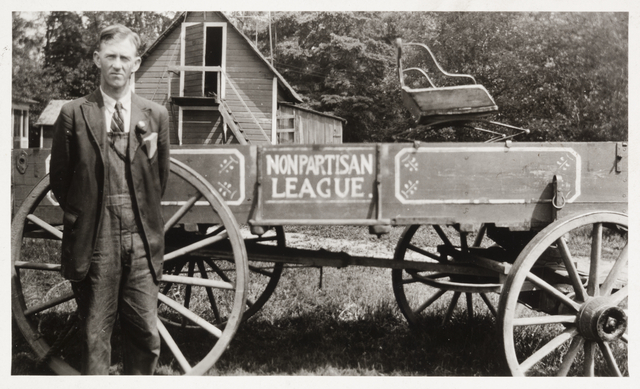 The Nonpartisan League was an agrarian movement begun in 1915 in North Dakota that soon spread to Minnesota. League members protested the poor market conditions of farmers. The League advocated economic reforms to relieve the plight of farmers, who were exploited by middlemen in the grain elevator, packinghouse, stockyard, and cold storage industries. Decried as socialist from its inception, the League actually rejected the third party approach, choosing instead to endorse whichever candidates pledged to support their program. Once World War I began, Leaguers were ruthlessly attacked as disloyal pacifists, and the Minnesota state government, through the Commission of Public Safety, was instrumental in crushing the League in 1918. After the war, these events led the U.S. Supreme Court to rule that the guarantees of the Bill of Rights must be protected from state interference.